Hakuna Matata from Hero Arts. The Swahili phrase is loosely defined as “no worries”. You can’t think of this phrase without thinking about the magical Broadway musical The Lion King. I saw this production in London and it was a powerful combination of movement, colour and music. This month’s kit from Hero Arts features the sights and colours of Africa. I think the kit sold out in about an hour. The stamp set has a multitude of animal, trees and birds stamps in the silhouette style. 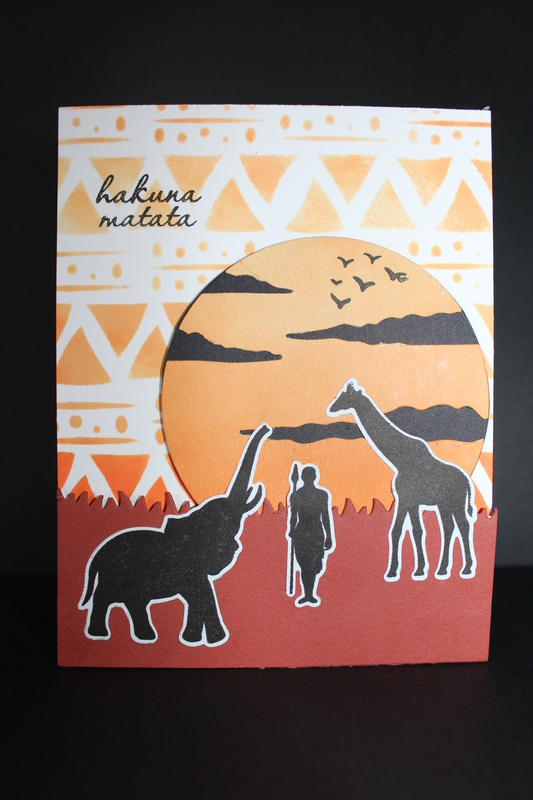 Of course this is perfect for the Serengeti sunset type of cards. No surprise that Hero Arts also included the perfect sunset die, so that cardmakers can do just that. There is no Hakuna Matata for me though, as the currency exchange and Customs wanting their pound of flesh is rapidly making getting these kits cost prohibitive. Good thing the starting price is a bargain. The images in the stamp set come in various sizes from medium size to to teeny tiny. This lends itself to creating cards with full scenes through to a collage of small images on tags, windows and frame dies. Lots of possibilities here, for future cards. Supplies: Hero Arts Kit for June, homemade stencil inspired by images on the internet and the add on stencil available from Hero Arts.